The energy output of the new fuel cell design produces about 20 percent of what is possible in hydrogen fuel cells currently on the market, but the system is about 100 times more effective than biofuel cells that use related organic shuttles. MADISON - Fuel cells have long been viewed as a promising power source. But most fuel cells are too expensive, inefficient, or both. In a new approach, inspired by biology, a team has designed a fuel cell using cheaper materials and an organic compound that shuttles electrons and protons. Fuel cells have long been viewed as a promising power source. These devices, invented in the 1830s, generate electricity directly from chemicals, such as hydrogen and oxygen, and produce only water vapor as emissions. But most fuel cells are too expensive, inefficient, or both. In a new approach, inspired by biology and published today (Oct.
3, 2018) in the journal Joule, a University of Wisconsin-Madison team has designed a fuel cell using cheaper materials and an organic compound that shuttles electrons and protons. In a traditional fuel cell, the electrons and protons from hydrogen are transported from one electrode to another, where they combine with oxygen to produce water. This process converts chemical energy into electricity. To generate a meaningful amount of charge in a short enough amount of time, a catalyst is needed to accelerate the reactions. Right now, the best catalyst on the market is platinum -- but it comes with a high price tag. This makes fuel cells expensive and is one reason why there are only a few thousand vehicles running on hydrogen fuel currently on U.S. roads. Shannon Stahl, the UW-Madison professor of chemistry who led the study in collaboration with Thatcher Root, a professor of chemical and biological engineering, says less expensive metals can be used as catalysts in current fuel cells, but only if used in large quantities. "The problem is, when you attach too much of a catalyst to an electrode, the material becomes less effective," he says, "leading to a loss of energy efficiency." The team's solution was to pack a lower-cost metal, cobalt, into a reactor nearby, where the larger quantity of material doesn't interfere with its performance. The team then devised a strategy to shuttle electrons and protons back and forth from this reactor to the fuel cell. The right vehicle for this transport proved to be an organic compound, called a quinone, that can carry two electrons and protons at a time. In the team's design, a quinone picks up these particles at the fuel cell electrode, transports them to the nearby reactor filled with an inexpensive cobalt catalyst, and then returns to the fuel cell to pick up more "passengers." Many quinones degrade into a tar-like substance after only a few round trips. Stahl's lab, however, designed an ultra-stable quinone derivative. By modifying its structure, the team drastically slowed down the deterioration of the quinone. In fact, the compounds they assembled last up to 5,000 hours -- a more than 100-fold increase in lifetime compared to previous quinone structures. "While it isn't the final solution, our concept introduces a new approach to address the problems in this field," says Stahl. He notes that the energy output of his new design produces about 20 percent of what is possible in hydrogen fuel cells currently on the market. On the other hand, the system is about 100 times more effective than biofuel cells that use related organic shuttles. The next step for Stahl and his team is to bump up the performance of the quinone mediators, allowing them to shuttle electrons more effectively and produce more power. 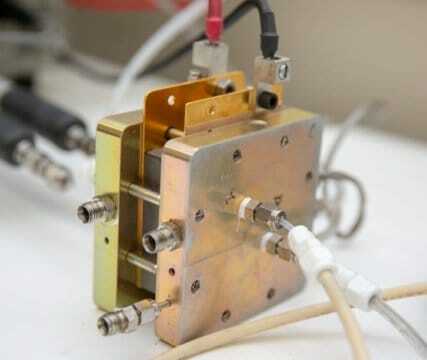 This advance would allow their design to match the performance of conventional fuel cells, but with a lower price tag. "The ultimate goal for this project is to give industry carbon-free options for creating electricity," says Colin Anson, a postdoctoral researcher in the Stahl lab and publication co-author. "The objective is to find out what industry needs and create a fuel cell that fills that hole." This step in the development of a cheaper alternative could eventually be a boon for companies like Amazon and Home Depot that already use hydrogen fuel cells to drive forklifts in their warehouses. "In spite of major obstacles, the hydrogen economy seems to be growing," adds Stahl, "one step at a time." Financial support for this project was provided by the Center for Molecular Electrocatalysis, an Energy Frontier Research Center funded by the U.S. Department of Energy, Office of Science, Office of Basic Energy Sciences, and by the Wisconsin Alumni Research Foundation (WARF) through the WARF Accelerator Program.